I remember fondly when this came out. I remember that it was an HBO production, and most importantly, that it was directed by Anthony Hickox, who I was as big fan of at the time. I loved the premise too, cops who turn into werewolves and dispatch vigilante justice in L.A.. But it's primarily an action flick, and above all else, that's really what sold me. And in that department, boy does this deliver the goods. I remember enjoying it initially, but I can honestly say that I haven't seen it since. So we're talking a good 24 years now, and I was hoping that this still lived up to those positive memories. And as chance would have it, I watched this during our much hyped Full Eclipse, but instead of going outside to view that, I decided to watch this "other" Full Eclipse instead. I think I made the right choice. Let's dig in. Max Dire (Mario Van Peebles) is a dedicated L.A. officer nearing the edge when his partner has just been killed. He soon meets a Special Team officer (Bruce Payne) who tries to recruit him to his "special" unit. Max soon realizes that this team is not what he expected and learns that this groups special brand of justice might be too much for him to take. Did Full Eclipse live up to my expectations? The answer is a big fat YES. I have to be honest, I'd watched a few films before this that just didn't do anything for me, so watching this one completely made up for that. It was everything I wanted in a film like this and more. 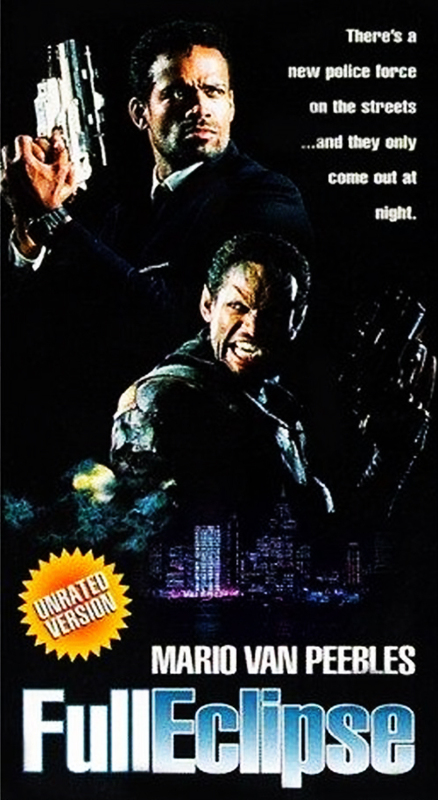 The best way I can describe it is that it's like an early 90's John Woo flick, only with werewolves. There is a ton of action in here, and it's hyper-stylized in a way that is very John Woo on steroids. And I have to give it to director Anthony Hickox (Waxwork 1 & 2, Hellraiser 3). For someone who's stuck primarily to horror up until this point, he does a fantastic job handling the action sequences. In fact, I'm sad he didn't end up becoming a bigger action film director or sticking to this very specific style of directing . But much like other directors, his visual style and approach began to change and he just never carried the same aesthetic or visual tone that some of his better earlier films had. Looking at his filmography, and their comments, reviews and ratings are tough to see. The guy and a lot of his DTV films have been slaughtered and savaged by bad reviews. But I guess I should judge for myself and check them out at some point. All I know is that I attempted to watch one of his later films once (forget which one), and I just couldn't get through it. It was a handheld shaky-cam mess and I couldn't believe it was the same guy who I admired so much up until that point. I mean, this is a guy who has done some amazing things visually with a lot of his early films, and I just can't stress that enough with Full Eclipse, a film that blindsided me with it's visceral punch of hard-hitting action and spectacle. While this film carries elements of both the horror and action genre, it's really in the action where Full Eclipse excels. 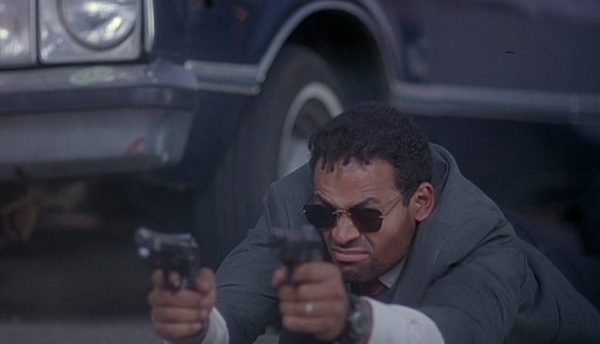 There was never a single moment during the action sequences where Mario Van Peebles wasn't shooting two guns at the same time while simultaneously flying through the air a la Face/Off or The Killer wearing a black suit and tie and landing on his stomach or back as he continues to shoot off rounds Chow Yun Fat style. Amazing. And again, it's also in Hickox's compositions and framing. Each scene, whether it be in the action or anything else, are so slickly realized and composited. It's hands down one of the slickest looking action films I've ever seen, and easily his most visually satisfying work to date. While Mario Van Peebles was excellent as the lead, special attention must be made to the lead villain here, played by none other than resident bad guy Bruce Payne, and oh my word is he just amazing here. His attempt at an American accent is one of the most mind-blowing things I have ever seen, and really makes the experience all the better. It's bad, cheesy, over-the-top and quite simply, amazing. The rest of the cast is pretty solid too, with no weak links. But again, the real star of this film is Payne, and he steals every single moment he's on film. While there's an insane amount of satisfying action, it's also a werewolf film, and in that regard, it also doesn't disappoint. I really have to give Hickox and HBO props for going the practical effects route on this one, because they could so easily have gone with lame CGI in it's infancy and it would have been absolutely dreadful. But I shouldn't really be all that surprised. After all, Hickox is the main who gave us the excellent Waxwork. Remember the werewolf design in that film? If you liked it, then you won't be disappointed here. Again, mad props to the team for going the old school route and not giving into the CGI fad. This was a blast from start to finish, and a ton of fun. 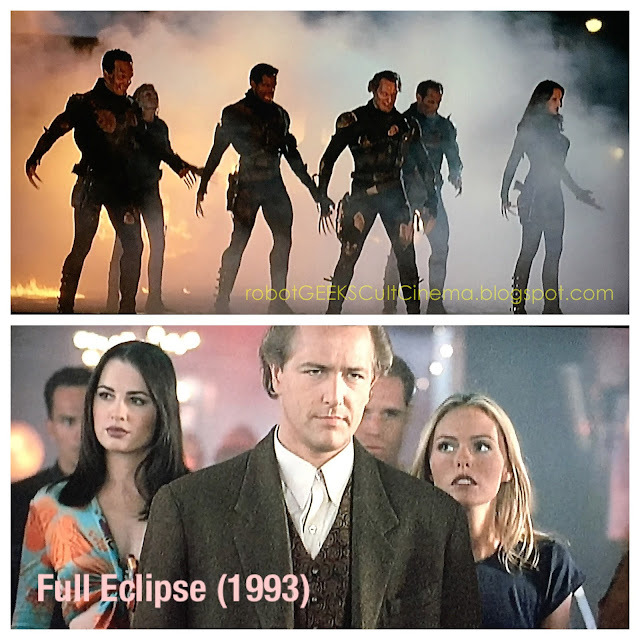 Much like other 90's films I've recently revisited such as Timecop and Freejack, Full Eclipse is an awesome example of this very specific type of action film, the 90's kind, and I really hope it gets a Blu Ray release someday. Though I will say that this DVD, even though it's from 2001, looks really good. The transfer was better than I was expecting, so I'm not complaining. Plus, I still dig those sweet snap-cases. If it's been a while, or if you've never seen it, it's absolutely worth your time to check it out. 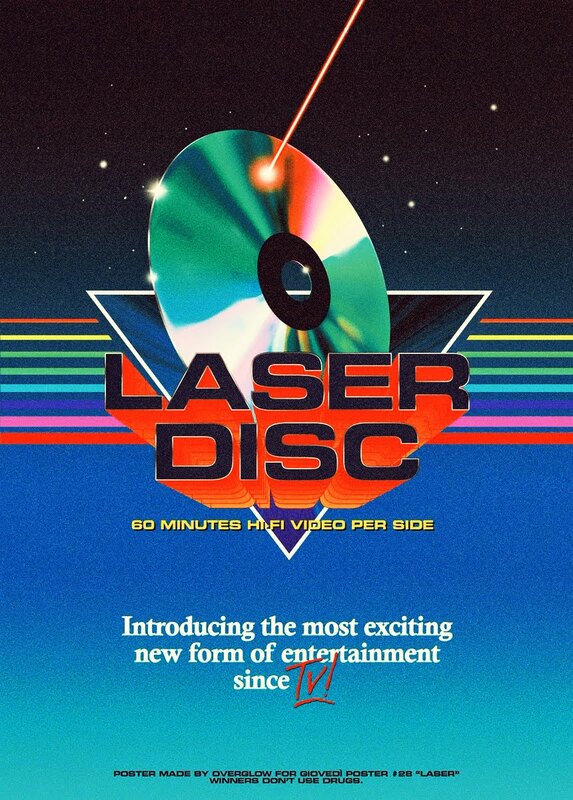 It's been released on VHS, Laserdisc and DVD. I haven't come across it to stream anywhere, and three's no blu ray in the works, but the DVD quality is actually pretty good considering it's age. Not streaming anywhere that I know of, but you can pick up any one of these physical formats for under $10.